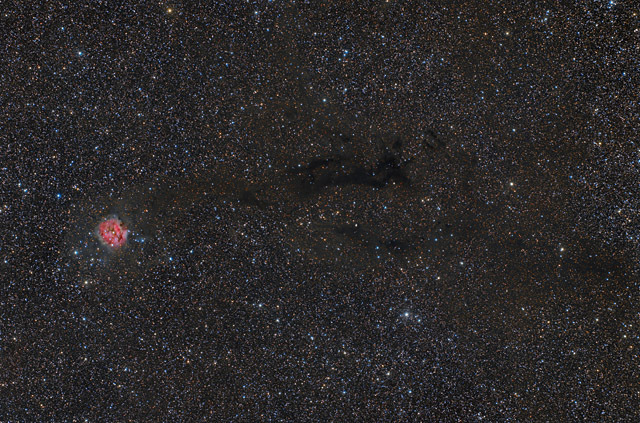 The Cocoon Nebula (IC 5146) is a beautiful emission nebula surrounding the newly formed star cluster, Collinder 470. The bright central star in the nebula is very young as far as stars go - only about 100,000 years old. It is likely that its the primary source of the energy to illuminate the hydrogen gas of the Cocoon Nebula. In the outer areas of the nebula is a subtle, blue reflection nebula that is reflecting the light from the hot blue stars within the nebula. This image also captures the full extent of Barnard 168 - a dark nebula that extends for 2 degrees towards the right of IC 5146. This image shows a section of sky roughly 3 1/3 x 2 1/4 degrees. In this image, North is Up. Software Used Images Plus 5.75 for camera control, calibration, and stacking. Images Plus 6.0.5 for ArcSinH stretching, star size reduction, feature mask, and color channel splitting and recombination. Photoshop CS5 used for levels and curves, screen mask invert, lab color, saturation adjustments, selective color, and match color. Gradient Xterminator for gradient removal. Carboni Tools for additional noise reduction, and smoothing. HLVG for additional color correction. Registar 64 for subexposure alignment and color channel alignment. Pixinsight 1.8 for dynamic background extraction, color calibration, histogram transformation, multiscale median transformation, morphological transformation, and exponential transformation. Notes IC 5146 was one of the objects that I had imaged back in 2011 with my C8. While it was a pretty good image, I had trouble with the gradient in my 20Da camera and the less than sharp optics of the C8. This image presents a much different view than the old image, and I'm very pleased with how well I was able to show the dark rift of B228 as well as a fair amount of dust surrounding it that I've rarely seen in other images. I used a completely new processing technique with this image in an attempt to pull out the fine detail. I'm very pleased with the final results, as my new technique brought out fine features that I've never had in an image before. In particular, the red dust lane in NGC 3190 has a good amount of detail, and NGC 3185 and NGC 3187 enjoy good resolution as well. This image was published by Astronomy Magazine as its Picture of the Day for April 10, 2017! !